Few of us are blessed with cavernous dining rooms. For many, it’ll be tucked away at the back of the house, while for others it may be integrated into the kitchen. If you’re struggling with space in your dining room, there are some ingenious way to make it feel a whole lot bigger. During the first decade of the new millennium, a rising trend of overwrought, large furniture put our small dining rooms at an even greater disadvantage. Luckily, in 2016, maximising available space is the name of the game, and we’ve got some brilliant tips to help you do just that. This is a simple one, and is a refreshing change to the heavy, imposing dining furniture of the early 2000s. 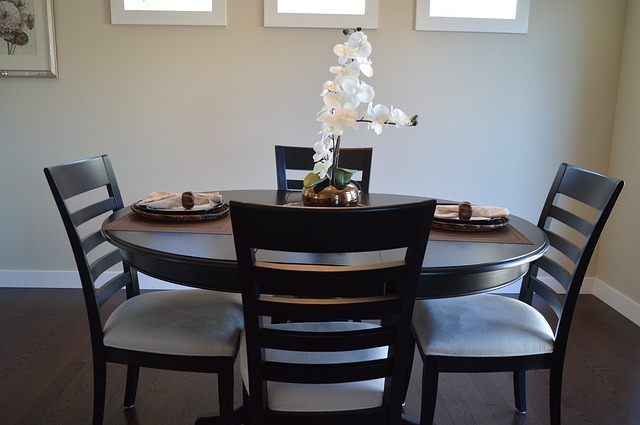 Start your dining room interior design project by buying small furniture. For example, go for a rounded table and four chairs without arms. The latter can be neatly tucked into the table and practically vanish from sight when not in use. While we’re on the subject of tables, a brilliant trick is to purchase one with a glass surface. It’ll open up the space and create an airy feeling. Feature walls are often reserved for fancy wallpaper, but instead try installing a sizeable mirror on the most prominent wall in your dining room. Wallpaper? Pah. What about filling your wall instead with a cityscape, endless seafront vista or the Gates of Argonath from Lord of the Rings? Wall murals are increasing in popularity and for a very good reason; they create a dramatic backdrop for any room and in the case of a small dining area, can create a perceived sense of greater space. If a wall mural isn’t your thing, it’s best to keep the decor of your dining room simple. Overly complex wallpaper patterns or too many shades of paint can make it feel like the walls are closing in. Go for light, pastel colours and make sure any hanging chandeliers or lamp shades are simple and non-intrusive. Folding tables can be put to brilliant use in the dining room. Unfolded, they’ll ensure the family have somewhere to eat come dinner time, and when folded, they can become something else entirely; a countertop for example. Alternatively, and if they fold up tight enough, you can store them away when not in use. Imagine a dining table which disappears from view when you’re not using it. You can achieve this magical feat by attaching the table top to a wall via hinges. Even better, why not add some storage behind it, which is safely closed away when the table is put to bed, and you’ve successfully killed two space enhancing birds with one stone.